I think John Muir best described what our life has become since we started traveling - "Going to the mountains is going home". While we thoroughly enjoy our life in our motorhome it is more a means to an end rather than the end itself. Hiking and backpacking, especially in mountains, will always be our first love. In our travels we have met quite a few hikers and backpackers. We have also met quite a few other full time RVers. However, we have yet to meet anyone else who does both. We hope we are not unique as we see our lifestyle as a perfect combination. So we’ll keep talking about it to anyone who will listen and perhaps we can inspire others to give it a try. This is our life and we love every minute of it. 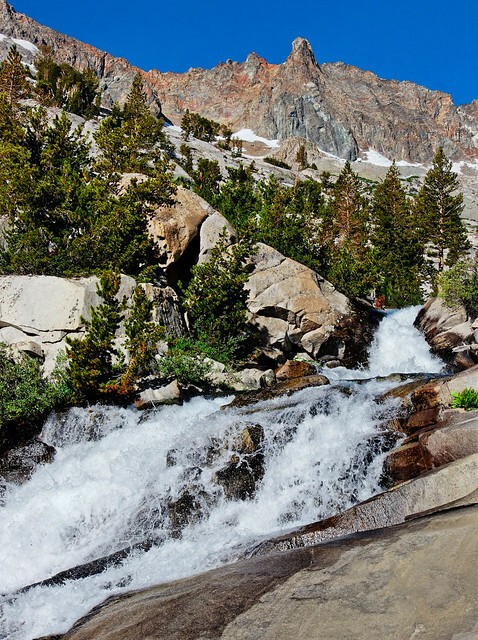 Hiking the John Muir Trail (JMT) in California was definitely a trip of a lifetime and we had a great time! After months of thinking about and planning for this trip it was such a relief to finally get started. We had everything we needed for the next three weeks except for the food in our resupply buckets that were waiting for us further down the trail. All we needed to do now was walk on average 10 miles a day for the next three weeks. 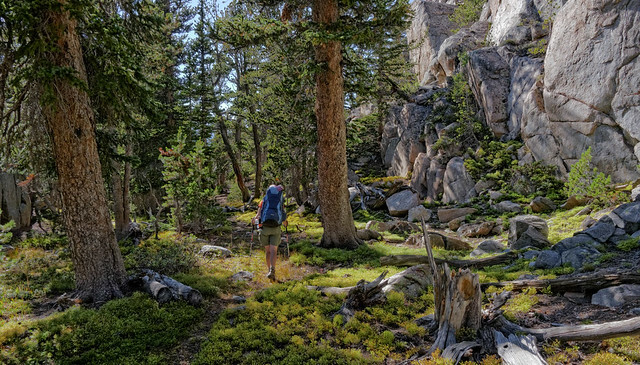 We decided to avoid the crowds of the Yosemite Valley and began the JMT at Tuolumne Meadows (with plans to do the part from Tuolumne to the Yosemite Valley after Labor Day in hopes that the crowds will have decreased). There were such a wide variety of experiences on this trip between the sights we saw and the people we met. The geography of this trail is incredibly varied and through the course of a day there is a great deal of change beyond the miles of trail that are covered. 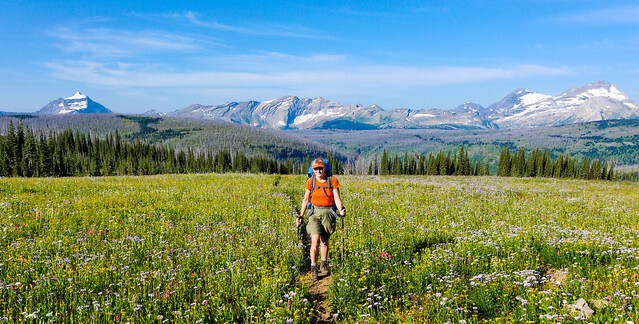 There are vertical changes when the trail that led you down through intimate valleys takes you back up above the timberline, past alpine lakes, on through expansive mountain passes before leading you back down again. 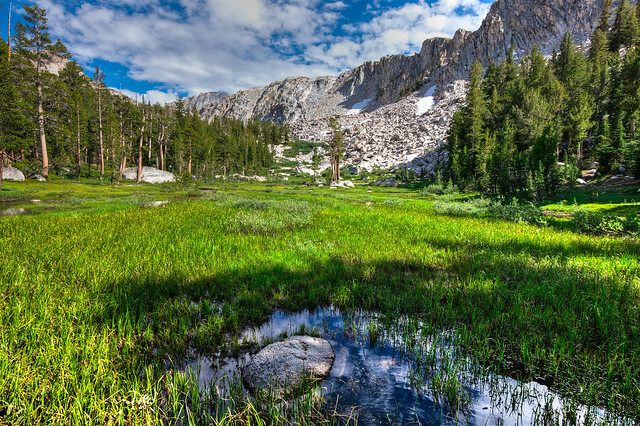 … to the cool grays, whites and blues of the rock, snow and crystal clear mountain lakes. In a way this trip was like two separate backpack trips. The first part was easier as we were carrying relatively lighter packs (John’s initially weighed 36 lb and mine 32 lb) at more moderate altitudes and with lower average daily mileage. It was only about 37 miles to Red’s Meadow where we would pick up our first food resupply bucket being held for us at the store. It was then only about another 42 miles to Muir Trail Ranch where we would pick up our remaining two food resupply buckets. For this second part we needed to carry 11 days worth of food to see us through the remaining ~120 miles to the trail head at Whitney Portal. Our packs were far heavier and the terrain more rugged and remote. 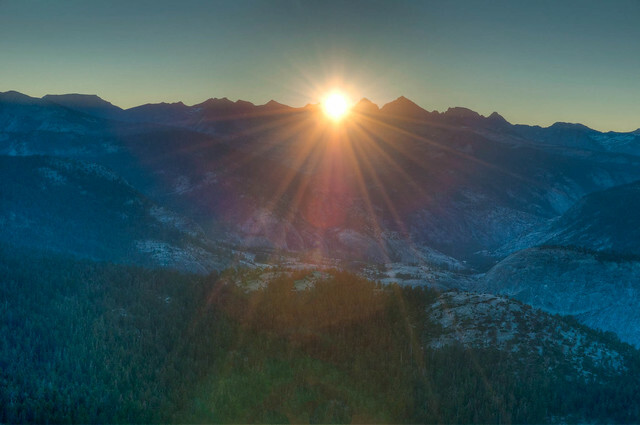 The JMT goes through eight mountain passes, six of them over 11,000 feet, and snow was a concern as this past winter the Sierra Nevada Range experienced near record snow fall. 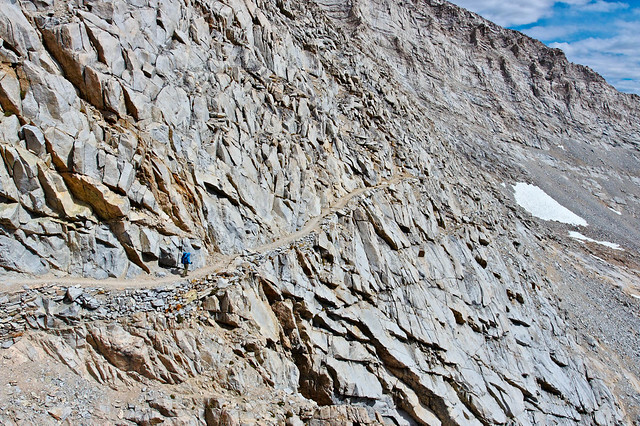 However, by the time we got there the snow in the mountain passes had melted enough that the remaining snow fields could be circumvented or crossed safely. 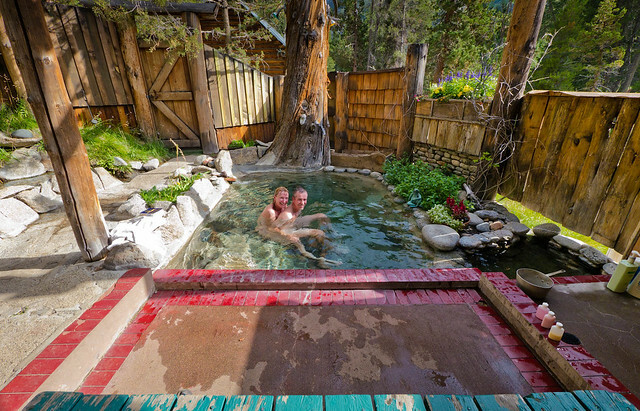 The snow melt created countless beautiful crystal clear pools and swelled the creeks and streams. All the waterfalls were amazing!. Besides the beauty all this additional water created other advantages included greener meadows and forests. Most importantly there were no fires. The downside was that there were more mosquitoes, but that was a small price to pay. The weather was amazingly consistent – Sunny and warm with predominantly clear blue skies. So unlike what we have been used to hiking in Washington State (and Oregon and Canada and Alaska and Colorado). There were some clouds, enough to make the skies interesting, but it only rained one day and that was on our rest day. It did get cold at night, as low as 20 degrees, but night time skies were usually clear and allowed us to see countless stars and watch the moon pass through nearly all of its phases. 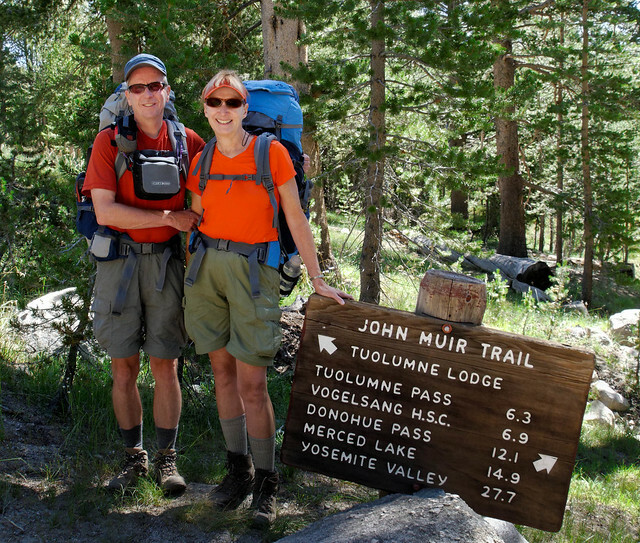 On the tenth day of hiking we needed to get to the Muir Trail Ranch (MTR), a guest ranch just off of the JMT, where we had reservations to stay one night in a cabin (Oh no! An appointment! We’re retired and we hate appointments!). When John first made our reservation I initially thought it would be “cheating” to stay there. 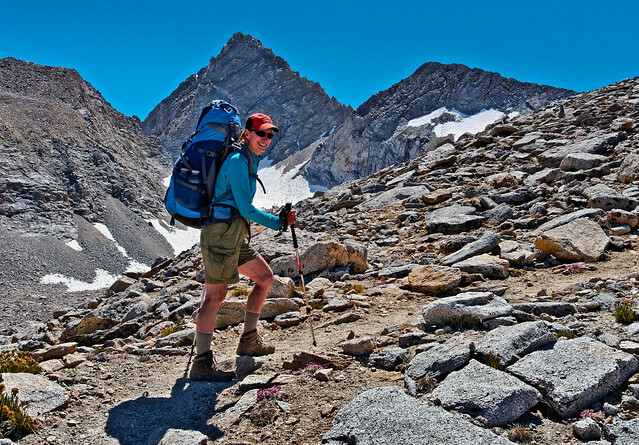 It helped to be reminded that even Pacific Crest Trail (PCT) thru hikers leave the trail every 7 – 10 days in order to clean up, resupply and fatten up on “real food”. The day before we were to arrive we talked to three reserved middle aged backpackers and we were interested to learn they had spent a night at MTR. They quietly confirmed my hope that we could get showers and do laundry there. John then asked them about the food and immediately all three began talking excitedly at once; “Oh it was great…Chicken Marsala… side dishes… roast beef…salads…the desserts…and the breakfast…it was amazing”! It was like a comedy routine and we couldn’t help but laugh (and couldn’t wait to get there). Once we did it felt like heaven. First we luxuriated in the shower then started our clothes washing and then “rested” in our secluded cabin (hey, we were both clean and all of our clothes were in the washer). After that we anxiously awaited the dinner bell. The food exceeded even our high expectations (roast pork, green salad, two fruit salads, two pasta dishes, fresh bread etc) and it was all we could do to avoid moaning aloud with pleasure. However, the fellow seated next to me felt no reservation and freely vocalized what we were both feeling. It was “all you can eat” and we went from eating ~3500 calories a day to eating that much in one meal. After the food the next greatest luxury at MTR is the private hot springs. We decided to take a day off and spent a second night there. It seemed like a great way to celebrate our upcoming 32nd wedding anniversary. After leaving MTR we were on our own for the remaining ~120 miles. 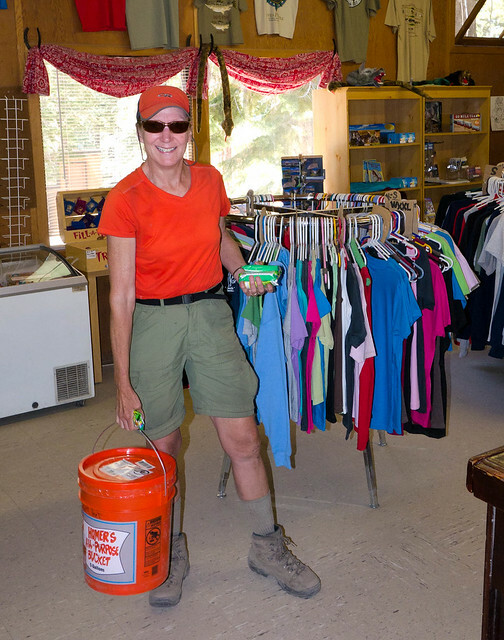 There are resupply options after that but all require hiking out (over a pass), hitchhiking into nearby towns (either Independence or Bishop) and staying overnight in a motel. We wanted to avoid that so we carried 11 days worth of food (John’s pack weighed 45 lb and mine 40 lb). We were hiking over more rugged terrain and at higher altitudes so we weren’t surprised to drop below our 10 mile a day average for the first few days after leaving MTR. We assumed that we could easily make it up once our pack weights started to drop. But it wasn’t as easy as we hoped. Part of the problem was we struggled with getting an early enough start. 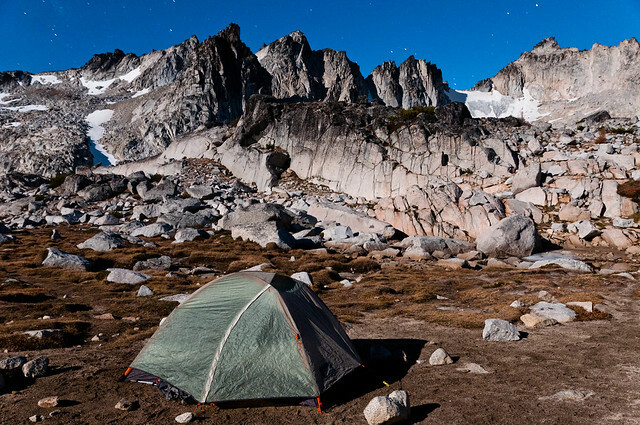 The high mountains on both sides of the JMT cause nearly all campsites to remain cold and dark in the early morning (and our sleeping pads are so comfortable). Once we finally got going John encountered far too many great photo opportunities. And we stopped to talk with a lot of really interesting people. In addition we enjoyed our lunch breaks too much and had trouble getting going again. But as we only had so much food we either needed to step up the pace or start conserving food. We did manage to get caught up. 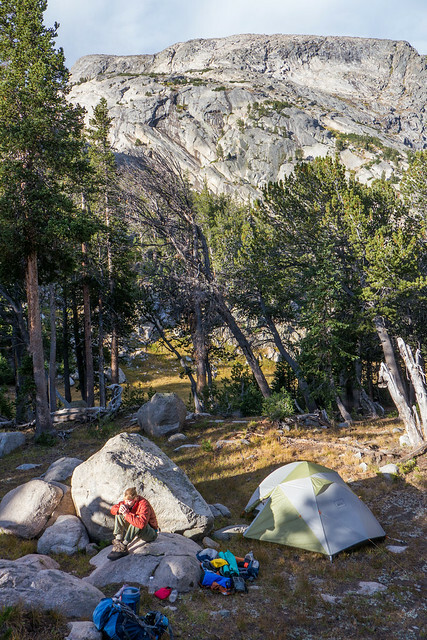 However, we did camp out an extra night (with not much food) as our plan to hike out the additional 11 miles of the Mt Whitney Trail and descend the ~6,100 feet needed to reach the trail head at Whitney Portal after climbing Mt Whitney to the end of the JMT was unrealistic. 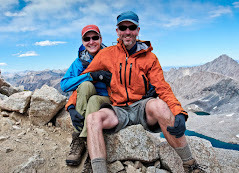 The end of the JMT is the summit of Mt Whitney and it joins the Mt Whitney trail for the last 1.9 miles. 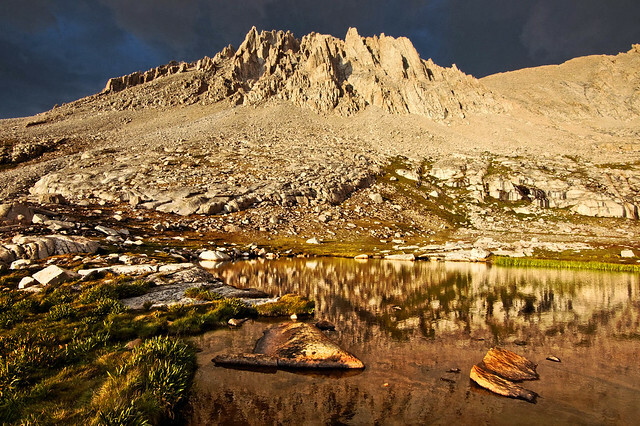 Climbing Mt Whitney is an extremely popular hike and a lottery is held for the 160 permits issued each day. 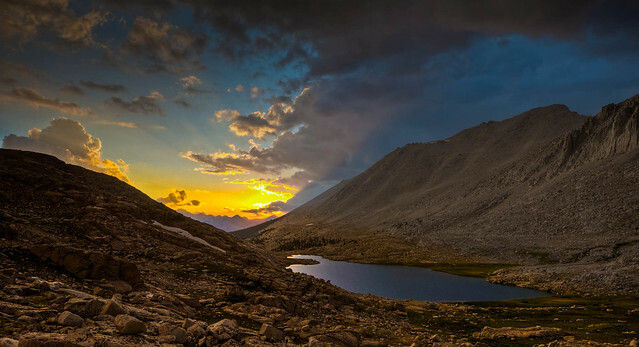 To go from near sea level to over 14,000 feet in only a day or so is quite a feat but for JMT hikers it can be anticlimactic, at least it was for me. Compared to the beauty we had seen during the previous three weeks along the entire trail these last few miles felt like we were just climbing a giant rock pile. 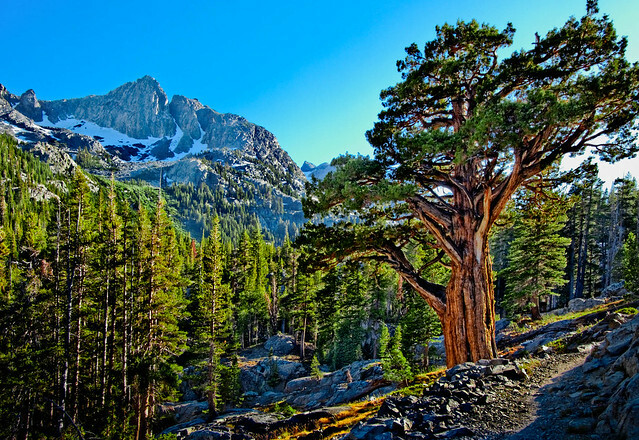 Black bears are common all along the JMT and the use of bear canisters is required. When we picked up our permit the ranger at the Wilderness Center told us to think of the bears as “big raccoons” and all one had to do was yell at them or throw rocks at them (I suppose this shows more respect for them than in Denali where we were instructed to treat them like “bad dogs”). Bear canisters are a nuisance to use and the extra weight is unwelcome but fortunately this measure has greatly reduced the number of encounters that JMT hikers have with bears and we were quite happy to not have seen a single one. And another huge advantage to using them is that they did protect our food from rodents. When we finally reached the parking lot at Whitney Portal it was such a relief to find our Subaru still in one piece. Parking lots in the area are "prowled" at night by black bears (possibly the ones who used to frequent trails) and they have learned to look through car windows and to recognize food containers, ice chests etc. 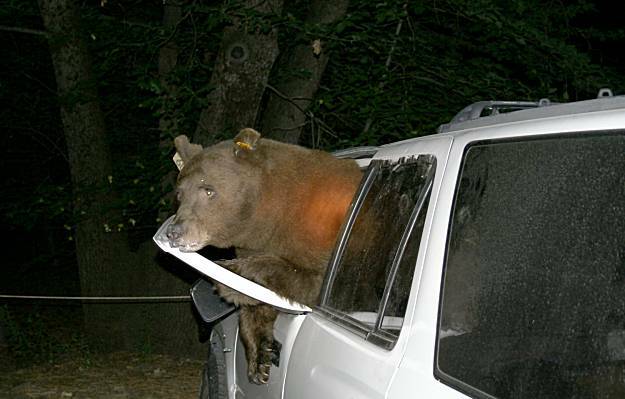 Large metal bear proof food containers are provided and everyone leaving vehicles overnight (or for weeks in our case) are required to remove any food related objects from cars as breaking into a car doesn’t seem to be difficult for a determined bear. Once we got back to Yosemite we were also relieved to find our motorhome undamaged as well. Owners of motorhomes are not required to remove all food items (we did close all of the shades). Lucky for us bears have not (yet) learned that motorhomes contain a veritable smorgasbord and that their claws could cut through the thin metal shell just like a can opener. 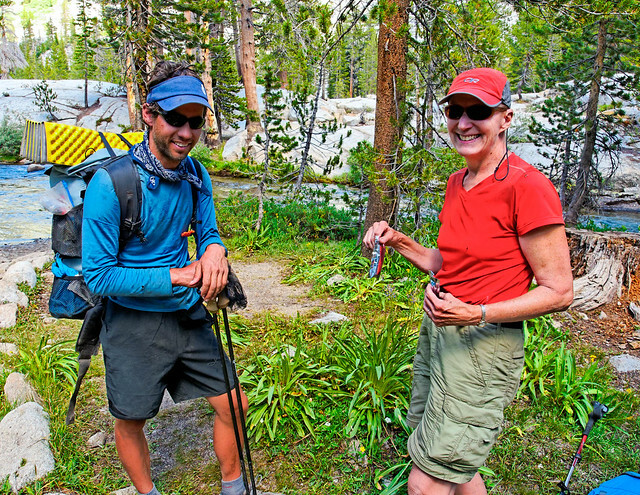 The JMT is a well populated trail and we met quite a few interesting people. To everyone we met - Thank you for stopping and talking with us, you made our trip that much richer. We’d love to hear about how the rest of your trip went. Please email us at panafoot@gmail.com. 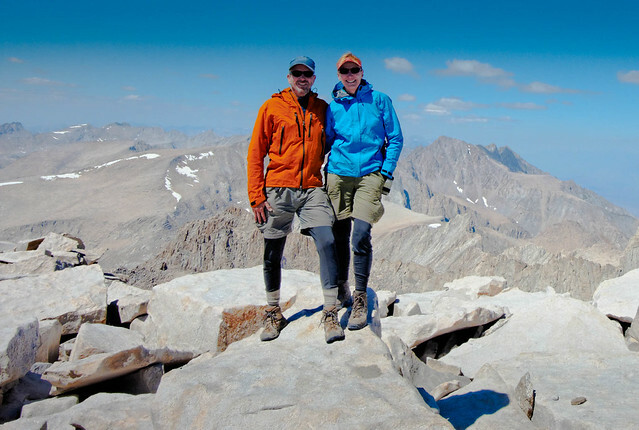 To Theo and Ken – We hope Ken’s ankle wasn’t as bad as we feared and you two were able to continue hiking. But if it was we hope you got out okay. The JMT will still be there next year. To Haley, Jordan, Kendra and Lauren (“Santa Barbara Four/Three)” – You all were the hottest topic on “Trail Mail” and we hope the rest of your trip went as planned (BTW those two guys who ate the poison berries passed us later on. They were fine after spending the night in Mammoth). 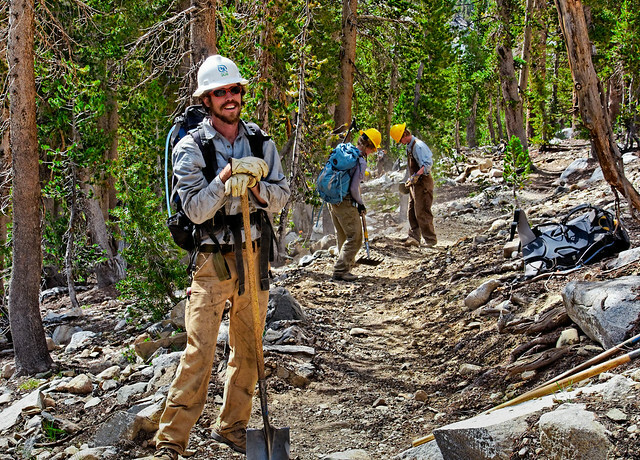 To Tim and all of you other hardworking trail crew folks – You are amazing! Thanks again! To Bill and Robin – We kept thinking we’d run into you guys again but then you both did look really comfortable when we last saw you by Woods Creek. To Aaron – Thanks for the samples of “Secret Drink Mix”. Best electrolyte replacement beverage I’ve had and we really could have used it when we hiked in the Grand Canyon. Aaron giving Jean a sample of the "Secret Drink Mix"
To Scott – No, we weren't stalking you. Jeez!?! To Carol – Thanks for stopping to get your picture taken again and we know you are so tired of hearing this but… You inspire us! Since we got back we’ve been resting up and editing photos. 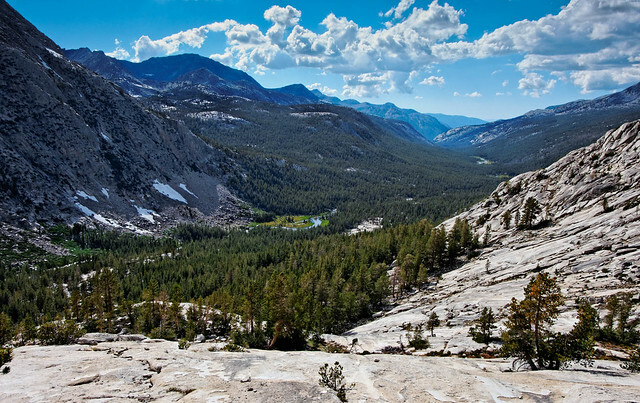 All of our John Muir Trail photos are on Flickr. We plan to spend some more time in Yosemite, we need to do that short segment of the JMT that we skipped and we'll climb Half Dome. After that? Well, we haven’t decided yet. 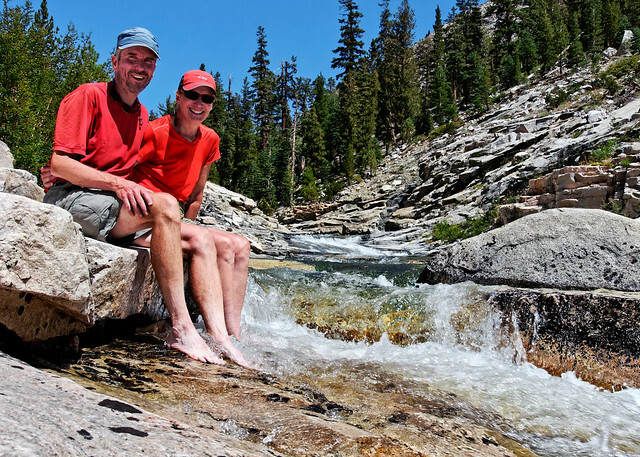 Hiking the JMT provided me with a great deal of time to think about why we love to backpack. It also gave me the time to think about my pack which was consistently heavier than I have carried in the recent past. I frequently thought about what we brought with us but could have done without. The phrase “lighten up” is at the forefront of a “backpacker’s mentality”. A backpacker must balance between how much stuff is needed to be reasonably safe and acceptably comfortable with how far they want to go and how fast they want to get there. The key words for us ever since we both hit the age of about 40 are “acceptably comfortable”. 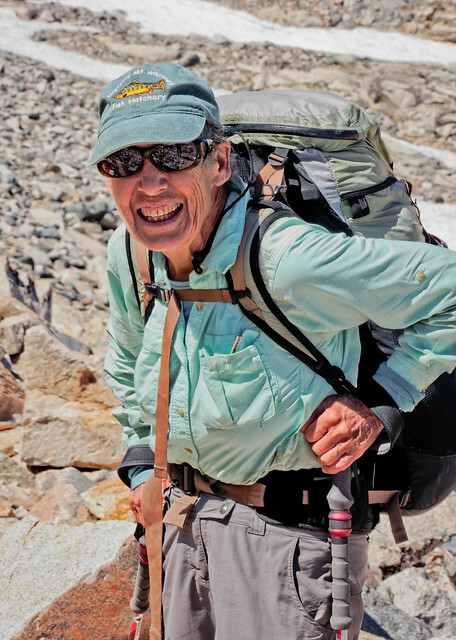 I have the utmost respect for Ray Jardine (the "father" of the lightweight backpacking movement) and all ultralight backpackers. However, we have felt compelled to make many concessions to our age and our desire for more comfort; inflatable sleeping pads, a spacious tent etc. 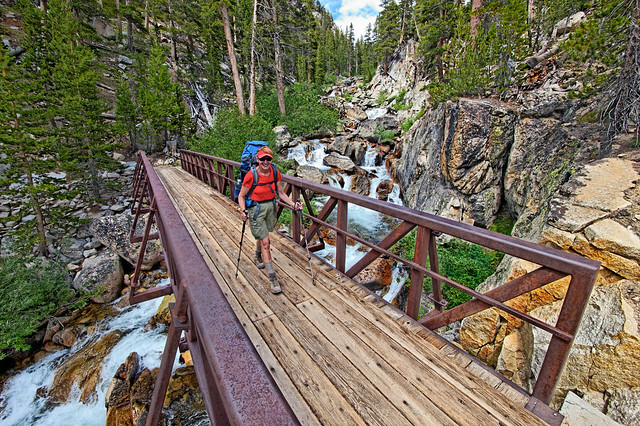 Judging from the size of many of the packs we saw on the JMT, especially those over 40, we are not alone. It has been my experience when talking to non backpackers about backpacking they can’t figure out why we want to carry a heavy pack for many miles. However, to a backpacker carrying the pack is only the means to an end. 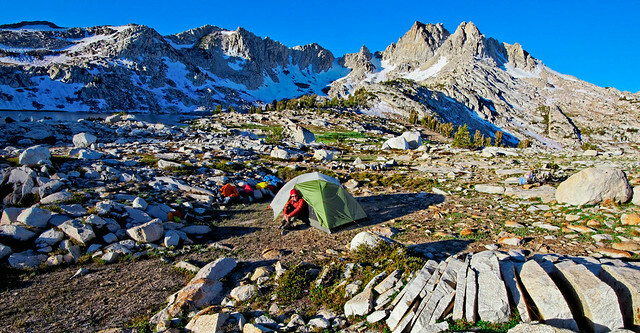 The object of backpacking is to get farther into the backcountry and stay for longer periods of time. Especially important to photographers like John as it is the best way to be in gorgeous spots for both evening and early morning light. 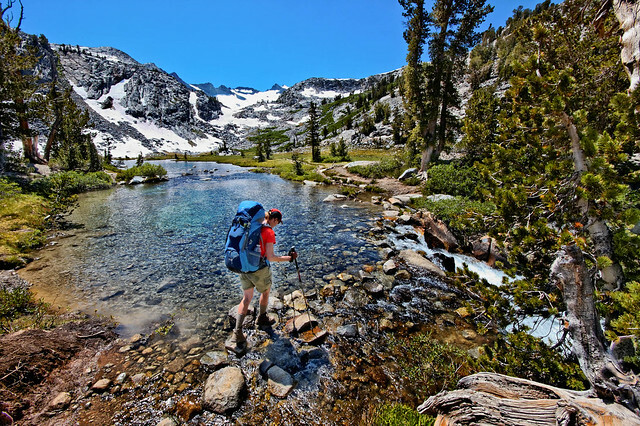 But something that became very clear to me on the JMT was how the “backpacker’s mentality” and the quest to “lighten up” goes so much farther than merely dealing with pack weight. It is a state of mind. First there is the feeling of freedom and the satisfaction that comes from being self sufficient. But most importantly backpacking enables us to “lighten up” emotionally by providing us with so many opportunities to find joy in life’s simple pleasures. …and how inspiring it is to meet other backpackers who are old enough to be your parents. Carol, 77 years young, and still going strong! But the best “lighten up” experience of all is when you first remove your pack you feel as though you are floating. How great is that! When else in your life (without the help of drugs) can you feel like you are floating? And backpacking allows you to "float" several times a day! 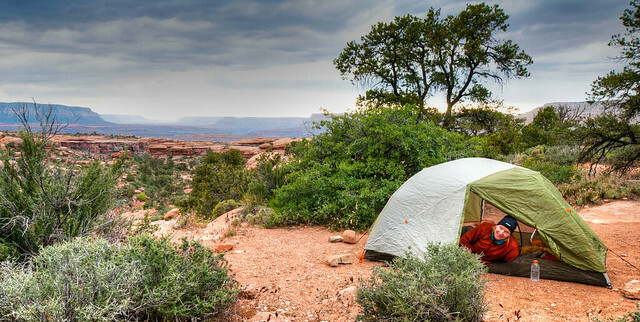 The benefits of this “backpacker’s mentality”, the ability to “lighten up” and enjoy simple pleasures extends beyond the backcountry. It follows us home where we discover anew the simple pleasures waiting for us. …and the convenience of indoor plumbing. In the words of Henry David Thoreau “There is no value in life except what you choose to place upon it and no happiness in any place except what you bring to it yourself”. That fellow I met on the trail had it right. We're alive and we're here! And indeed, it doesn’t get any better than that. Oh, how wonderful your words are that accompany the fabulous photos... Thank you! At the risk of sounding like a broken record, "amazing and inspirational"! We really enjoy your writing and the photographs are superb. On the issue of pack weight, we had tried to reduce our pack weight for several years (which perhaps was silly as most of our trips were via canoe in Minnesota's BWCA). While we succeeded in reducing pack weight, we found that we were not enjoying the trips as much, having compromised comfort for lower pack weights. I think we have now found our happy medium for gear, and dehydrating our own meals (and judiciously carrying a pound of bacon from time to time) has kept our bellies happy without penalizing our shoulders. I just stumbled onto one of your beautiful photos on flickr and then somehow found my way to your blog. Absolutely wonderful!! My wife and I are both still very young and working and still in school and unable to dedicate the time for such hobbies... but this inspires me. Keep up the adventures!! Amazing photos and wonderful commentary! I hope you are enjoying every moment! 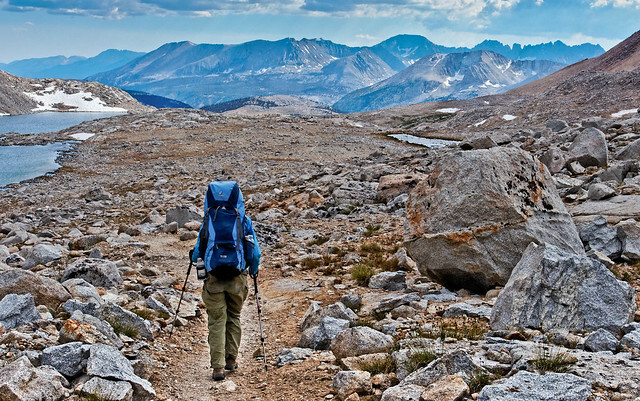 I don't think I've ever read words on the value of backpacking so elegantly and succinctly put. And the pictures to go with the words are perfect. 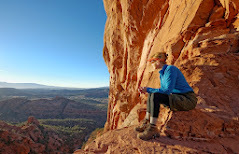 Thank you for helping me to articulate what I always knew about backpacking but could never adequately express.